When space opens up in our yoga practice or our life, how can we lean into that space? There is a moment in every dedicated yoga practitioner’s life when you fall. I don’t mean falling out of a yoga asana like headstand. I mean when you fall deep into a yoga or contemplative practice. Falling deep into practice is where we stop looking for anything, or trying to gain anything. Where the identity of practising falls away and we move into the awareness of practice itself. You’re just falling into, or we could even call it feeling into, the process called yoga. Falling into the process is a unique experience individual to us all, but for me it’s one of the things that defines yoga. So, the practice of yoga offers us this falling. But what is it that we are falling into, and what are we falling away from? The reason that most yoga and meditative traditions use the breath as a tool for their contemplation is that it allows us to move towards identifying what the breath actually is and away from what we think the breath is. It’s really simple but we compartmentalise our lives. I see me, I see ‘my’ breath. It can take years to come to the awareness that there is no ‘my’ breath. There is just breath. As soon as I say ‘my breath’ I am identifying with a breath that is mine. Our practice is to see that breath is not mine, breath just is. When we notice the breath as just the breath, our sense of separateness drops. This means that the mind’s hold on the idea of the breath falls away. So when we fall into practice we are letting go of the identity of who we are. We become the thing we are noticing. We don’t just breathe, we become breathing. So when we fall into practice we are letting go of the identity of who we are. We become the thing we are noticing. We don’t just breathe, we become breathing. Our identity, or the story of me (in Sanskrit this is called asmita), is how we engage with the world through relationship. There has to be a me that decides to practise yoga. However, as soon as I engage with the decision to practise, I see the practice itself is to let go of my identity and focus on the things that I actually am, beyond my identity. For example, in the practice of Ashtanga yoga the focus would be the breath (through the technique of Ujjayi), the body (through the technique of bandha) and the synchronisation of those processes through movement called vinyasa. Then my practice is to cultivate a stable awareness of vinyasa, so the quality of attention stays with the alignment of the breath and the body together. It is to see that rather than doing the vinyasas, I become the vinyasas. Cultivating this awareness then offers us the possibility to find space in our lives. With the mind consistently waking up to the processes of the human experience during the practice, that practice is remembering to focus on the breath, we can become aware that those processes are actually our lives. In Ashtanga yoga each counted vinyasa is a moment in time to fall into and each breath is representative of the present moment. So our practice is actually allowing us to fall into the present moment. To develop the skill to remain present is one of the goals of yoga practice. Interestingly, these moments of falling are also captured in natural settings. Watching a sunset, getting lost in the flames of a bonfire, or witnessing the flickering of a candle are places where, just for a moment, the turnings of the mind can fall away. These moments can then become the experience of the sunset itself, or the warmth of the flames or the gentle movement of the candle. One of my favourite quotes, by Huang Po included at the top of this article, offers us the possibility to consider these moments as where our life actually begins. The falling through the void. The real Dharma. Dharma means your life. Entering the real Dharma is entering the reality of your life. This one beautiful life. Dharma means your life. Entering the real Dharma is entering the reality of your life. This one beautiful life. So we are falling into really discovering life, our own nature. Can we see the possibility that our practice is to fall away from the turnings (vrittis) of the mind (chitta) to actually see ourselves as nature itself, like the sunset, the bonfire, the candle flame? 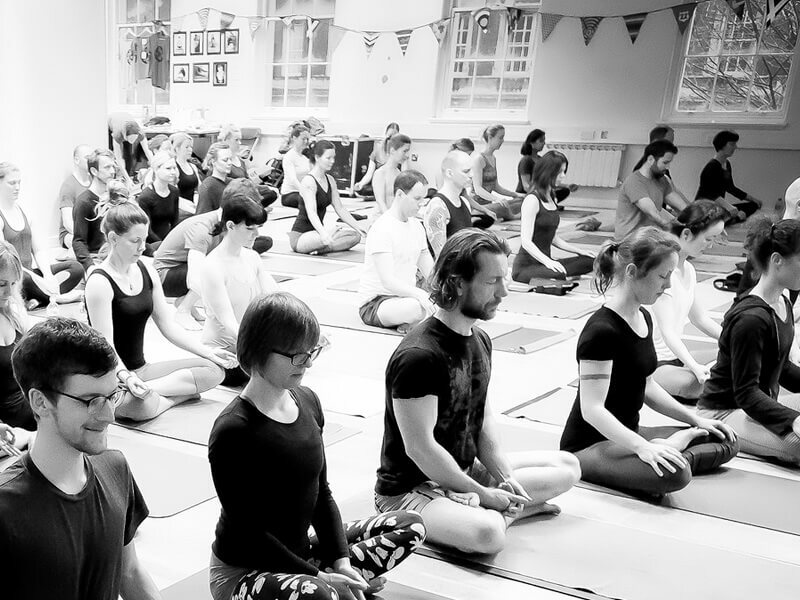 Setting your practice with that quality, that intention, is to me what practising is about. “Yoga is just 3 words. To me, this is beautiful. There is something incredibly powerful when you repeat an intention three times. Saying something once with deep intention can have meaning. When you say it again it increases the power of that meaning. When you reinforce it a third time it has the potential to reach underneath your conscious mind and land internally in a deeply embodied way. Language can profoundly move us. So, each time we breathe we are entering our life, each time we link our breath to our movement we are entering our life. Each time we leave our yoga mat we are entering our life. We are, in every moment, willing and creating a new way of seeing of ourselves, a new way of seeing the world. Deeply dedicated yoga practice helps us fall into this. So, each time we breathe we are entering our life, each time we link our breath to our movement we are entering our life. Would you like to wake up to life? If you’re falling deep into your yoga practice, or you want to lean into the space in your life, come join us for our daily Ashtanga yoga classes at London Bridge.